Atmospheric researchers from around the globe convened in Kathmandu to discuss the connections between air pollution and the Asian summer monsoon during a four-day workshop from 9 to 12 June. Changes in the Asian summer monsoon have implications on the weather, people’s health, agriculture, and glaciers of the entire Hindu Kush Himalayan region. However, there is a need to improve understanding of the underlying sources and processes driving these changes. “The functioning of the Asian monsoon and its connection to air pollution is a major concern in Nepal and the entire region. The summer monsoon plays an important role in life in Nepal, but it also brings destruction in the form of cloudbursts that commonly result in floods and landslides. Understanding what is driving changes in the Asian summer monsoon is important,” said Dr Rabindra Shakya, Vice-Chair of the Nepal National Planning Commission and Chief Guest at the workshop. While the Asian summer monsoon is a part of local life of people in the region, it is also a global climate issue. “Asia is witnessing rapid economic development and population growth. As a result, man-made emissions are on the rise. The interaction between these changes and the Asian summer monsoon is affecting the composition of the upper levels of the atmosphere, which in turn can affect the climate of the entire northern hemisphere,” said the meeting’s co-chair, Laura Pan, atmospheric scientist at the US National Center for Atmospheric Research (NCAR). With more than 100 participants, the workshop on the Atmospheric Composition of the Asian Monsoon was the largest ever gathering of atmospheric scientists in Nepal to share knowledge and develop collaborative efforts to improve understanding on this important issue. 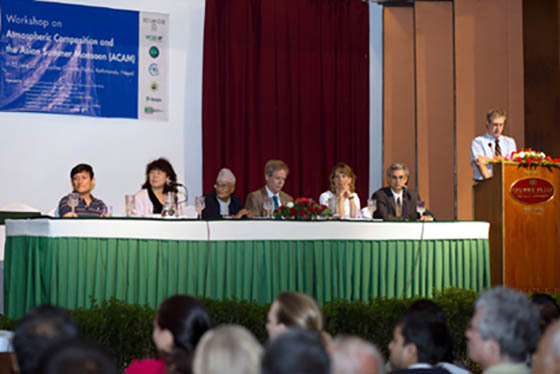 It was jointly hosted by the International Centre for Integrated Mountain Development (ICIMOD) through its Atmosphere Initiative together with the US National Science Foundation; the National Center for Atmospheric Research (NCAR); the International Geosphere Biosphere Programme’s Integrated Land, Ecosystem, Atmosphere Processes Study (iLEAPS); the International Global Atmospheric Chemistry Project (IGAC); and the World Climate Research Program’s core project on Stratosphere Processes and their Role in Climate (SPARC). “Through the knowledge gained from discussion and research taken forward after this meeting, we will be able to design more effective policy to address complex, transboundary atmospheric issues,” added Dr Shakya. At the workshop, researchers discussed ongoing research about emissions and air quality, about aerosols and clouds, convection and chemistry, and about the upper atmosphere. They discussed how aerosol pollutants affect monsoon clouds and rainfall, and how convective clouds in the monsoon transport pollutants to high altitudes where they have an impact on global climate. Researchers also discussed the complex role that black carbon and dust particles are playing in increased glacier and snow melt at high altitudes in the Himalayas. “Atmospheric issues know no borders and have implications on the health of the people and ecosystems of the entire Hindu Kush Himalayan region. The first step to addressing these issues is to improve understanding of the underlying processes, the sources of emissions, and the chemistry behind changes in the monsoon. From there we can develop effective ways to work together to develop mitigation measures,” said ICIMOD Director General Dr David Molden. During the session on emissions and air quality, several researchers highlighted the effects of seasonal biomass burning in relation to impacts on health as well as the photochemistry of the atmosphere. The trend of open crop residue burning is on the rise in South Asia as the traditional method of tilling paddy stock back into the field is being replaced because of rising labour costs and the limited time available before the next crop of wheat must be sown. Several presenters also highlighted the link between changing land cover – a result of urbanization – and changes in emissions and meteorology, including surface temperature, and changing ozone levels, which have implications for air quality, health, and crop productivity. “Given Asia’s vulnerability to climate change, things are going to happen. We, as researchers, can use our knowledge to help facilitate better policy and greater regional collaboration,” said Greg Carmichael, University of Iowa, USA.